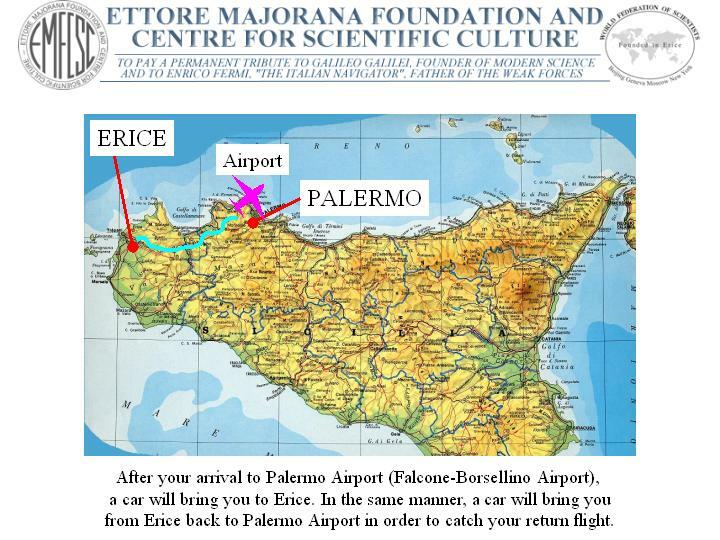 Transfers to and from Erice are provided by the Ettore Majorana Centre. From either Milan or Rome it is relatively easy to reach Erice. You must take a train to Trapani. Erice is situated on the mountain overlooking Trapani. From Trapani take a taxi to Erice. Confirm the price before taking the taxi. from Villa San Giovanni to Messina and drive to Erice (350 km from Messina). 2) Take the ferry-boat either from Genoa or Naples to Palermo, and then drive on to Erice (100 km from Palermo). The places on the ferry-boat must be booked in advance.